If you are looking at your next expansion project or investment in a rural county and are you having a problem finding financing for your growing business? Since 2013, small businesses in many rural counties have found that accessing SBA 504 loans has become difficult because a significant number of rural Certified Development Companies (CDCs) are no longer in business. The end result is that affected rural small businesses are struggling to find the financing that they need to buy new real estate and machinery needed to keep their companies growing. So, what can rural small business owners do when they need to finance their company’s growth? BizCap clients can benefit from a new two year pilot program from the SBA. The program allows CDCs like BizCap to issue SBA 504 loans in rural counties in any state that is within their SBA region (BizCap is in Region 5.) 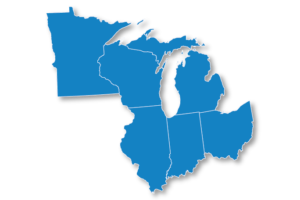 Region 5 includes Illinois, Indiana, Michigan, Minnesota, Ohio, and Wisconsin. To simplify maters, the program applies in any county that has been classified as “mostly rural” or “completely rural” by the US Census Bureau. Don’t know if your business is located in a rural county? Call us and we’ll let you know. Not familiar with the SBA 504 loan program? 504 funds can be used to finance the purchase or construction of owner occupied commercial property or the purchase of equipment. Benefits of the program include fixing the interest rate for the term of the loan at below industry rates. Real estate rates are fixed for 10, 20, or 25 years. Equipment rates are fixed for 10 years. In the typical SBA 504 loan structure, the third party lender, bank or credit union, finances 50% of the project, SBA finances 40%, and the borrower injects 10%. This allows the borrower to retain more of their operating cash. Have questions or want to discuss a possible loan? Call Gary Fischer at 937-531-7038 for all the details of how an SBA 504 loan, or one of our other loan programs, may be able to help your growing business.